Indiana’s #1 Trotting Sire in 2016 Money-Earnings! Swan For All had an extremely impressive 2yo season with 4 wins and 1 second in 5 starts and established a 2yo mark of 1:54.3. In doing so, he won the elim and final of the Am Nat, the Int'l Stallion Stakes and finished second in the Bluegrass behind Muscle Hill. At 3, Swan For All was the winner of a Matron Stakes elim and final and was runner-up in the Bluegrass Stakes. He won or placed in 10 of 11 career starts. 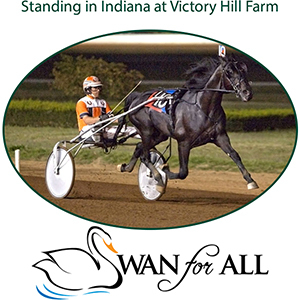 Swan For All hails from a royal family that includes POSSESS THE MAGIC 3,1:53.2 ($1,043,503), MUSICAL VICTORY, Breeders Crown winner of more than $500,000, and top-producer HIGHER LOVE, dam of the great LOOKOUT VICTORY ($1,921,611). His top progeny is led by World Champion and 2x Breeders Crown winner HANNELORE HANOVER 5,1:49.2 ($2,377,564). Many of his progeny have excelled in the Indiana Sire Stakes programs and include ANDI’S ALANA 3,1:55.0 ($528,749), 2017 Breeders Crown winner FIFTYDALLARBILL 2,1:55.0 ($458,950), BLUEBIRD REVEREND 4,1:53.4 ($411,084), SWAN CHASE 3,1:53.2 ($387,218) and the 2yo filly O SO EASY 2,1:54.3 ($267,550). Congratulations to 2017 Breeders Crown winners Hannelore Hanover (Open Trot) and Fiftydallarbill (2YO Colt Trot)! 2019 BOOK FULL & CLOSED!! !